Skiing and snowboarding both offer the chance to get out on the slopes and enjoy yourself, but actually deciding which one you want to start with may be a difficult choice to make. If you’ve never done either, how do you know which is right for you? Typically, the choice depends on outside factors like what equipment you already have, for example. If you are renting equipment, on the other hand, you get the luxury of choice. Skiing is a much older sport, and the learning curve for beginners is actually not too bad. When you begin skiing, you learn basic movements but also have ski poles in your hands. You learn to turn and basically “skate” along, and after you learn a parallel turn, you can basically make it around to a large number of locations. While this is good, many people don’t get much further before they begin taking on larger slopes. It can be easy enough to ski, but it takes a bit of work to ski well. This is similar to snowboarding though, so shouldn’t be a deterrent to either choice. An advantage to skiing is that you do have poles, so if you get caught in a flat area you can help yourself out. One of the biggest disadvantages is that skiing works best on tightly packed and bumpy/icy snow. There is a myth that snowboarding causes more falls, more injuries, and is generally harder. This seems to stem from the fact that while you are moving downhill both of your feet are strapped in tightly. Although this can be a bit scary, it actually is common to learn on a low sloping wedge with one foot resting on the board, not actually strapped in. Modern teaching techniques are much safer (and lead to less falling and bruising) than what was used in the past. Also, snowboarding works best in deep powder, which is softer to fall into if you do happen to fall. Additionally, snowboarding is easier on the knees than skiing, which can be an advantage if you have weaker knees already or are prone to knee pain after exercise. Although it is possible to pick up snowboarding quickly but not particularly well, many people find that they pick up snowboarding quicker. This includes skiers that change over snowboarding in the future - the often feel like they pick it up in less time than it took to learn to ski. If you have absolutely no idea! Some resorts offer the option to try both, but it wouldn’t be recommended to try them both on the same day. One of the more obvious points that is often discussed is that snowboarding requires boots, a board, and a helmet/goggles. Skiing does require more equipment, and seems to be the world of technical specs and jargon to outsiders, but this isn’t always a bad thing. The important thing to remember is that it is a personal choice which you try, but be open to either option. 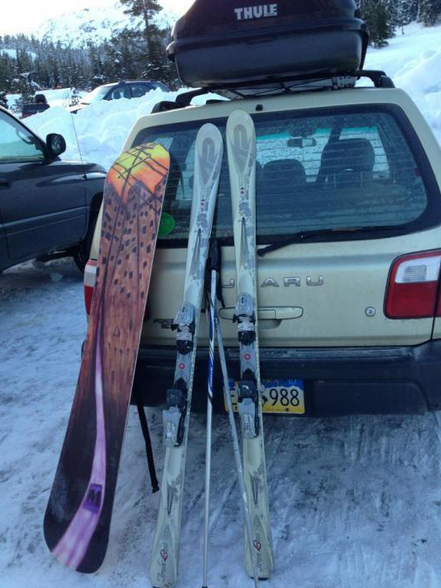 Of course, something to consider is how cool your gear will look leaning against the car -- snowboarding generally wins this one. Which did you try out first? If you’ve done both, which do you prefer? Let us know in the comments.